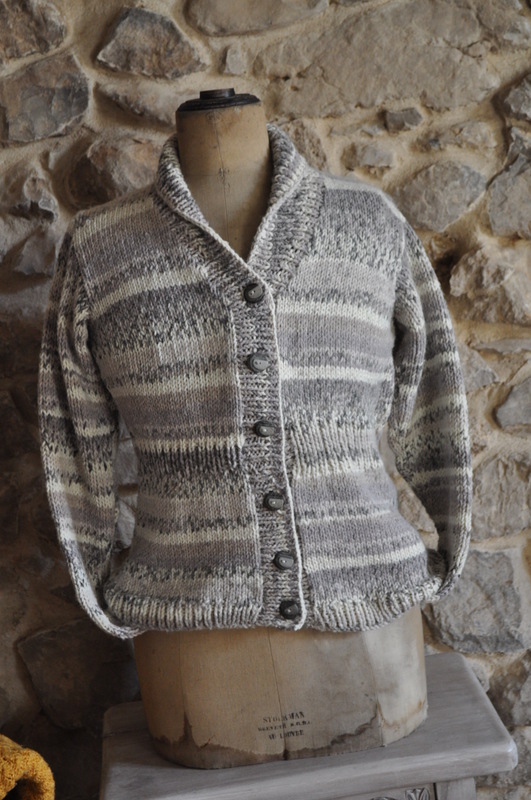 Remember the fuss I made trying to choose between two different colours of yarn to make the ‘boyfriend’ cardigan from the knitting book Storm by Kim Hargreaves? 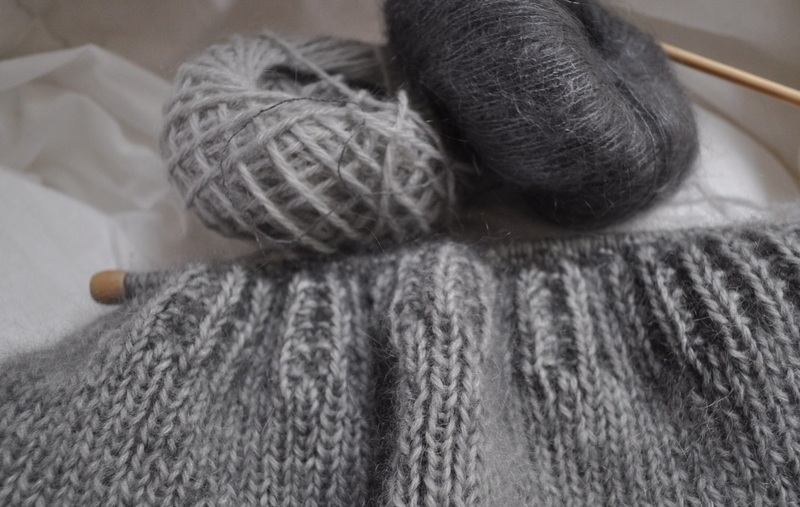 I blogged about it back at the end of last year and, having canvassed your opinions, I went with my instincts anyway and chose the dark grey fine mohair instead of the purple to knit together with the pale grey thicker ‘base’ yarn and here’s the result. It’s soft and squishy and nicely oversized but not by too much . My worries about the sleeves only fitting an orangutan were unfounded – it’s just that, being raglan sleeves, they seemed to go on forever when they were on my needles. Here it looks a bit like your Grandad’s cardie rather than your boyfriend’s but I like the stitch used which gives you that wide rib stitch effect in relief. I sewed the silver metal buttons on then, for a touch of femininity and also for strength, I backed them with some little floral buttons. I really am pleased with it and to prove to Kate who always tells me off for being too self critical that I can, in fact, be proud of my work, I’m not going to point out any faults because there aren’t any. Ha!! This is what’s on my needles at the moment but, even though, I like the yarn (James C. Brett Marble Chunky) and it knits up quickly and is reasonably priced and even though it’s fairly unusual to find a knitting pattern for a jumper with a scooped neck and a fitted shape I know I’m not going to love it as much. The yarn for the cardigan was Rowan Kid Classic – a wool and mohair blend and Rowan Kidsilk Haze, a mohair and silk blend which were knitted together and it has produced such a soft, luxurious garment that anything made with acryclic is going to pale into comparison. Having said that, the Rowan yarn was expensive – despite me scoring both the yarns on Ebay – so, unless you’re going for a ‘special’ knitted item, I guess the cheaper yarns will always have their place. Of course, I do still have the purple Kidsilk Haze I didn’t use for this cardigan so I might keep my eye open for some coordinating Kid Classic in the sales and then I can make another one in a purple shade – if I can face those never ending sleeves again that is. Mac, the kitten, likes it anyway. He appeared from nowhere. 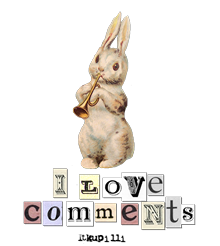 Knitting and cats – it really is like moths to a flame. How do you feel about knitting (or crochet) yarns? Do you prefer to wait until you can splash out a bit and use the best quality or do you prefer acrylic blends for their easy care qualities which, for some projects is a big consideration of course, or perhaps you can’t wear wool next to your skin? Sorry, I couldn’t resist that title with my lead photo. My Mum has been visiting and, usually, I save up or start a knitting project to be companionable as she always brings some knitting. However, this time, she has decided she wants to get into sewing and so I have been helping her with some of the basics – and I mean the real basics. She wanted to go into the only local fabric shop so I had to walk past the fabric with my eyes straight ahead (due to fabric fast) until I got to the woolly bit. There’s not much choice to be honest and it’s all Bergère de France stuff which I can take or leave and what stock they do have is of the more boring standard variety and nothing to get excited about. However, they did have two very large sheep made of wood with thick woollen fleeces. They were a bit pricey but then I spotted the mini one with hanging string and Mum added it to her magnetic pincushion and cord purchases* and gave it to me as a little gift. I mentioned before that I was planning on knitting a Kim Hargreaves pattern called ‘Drew’ which is from her ‘Storm’ pattern book. 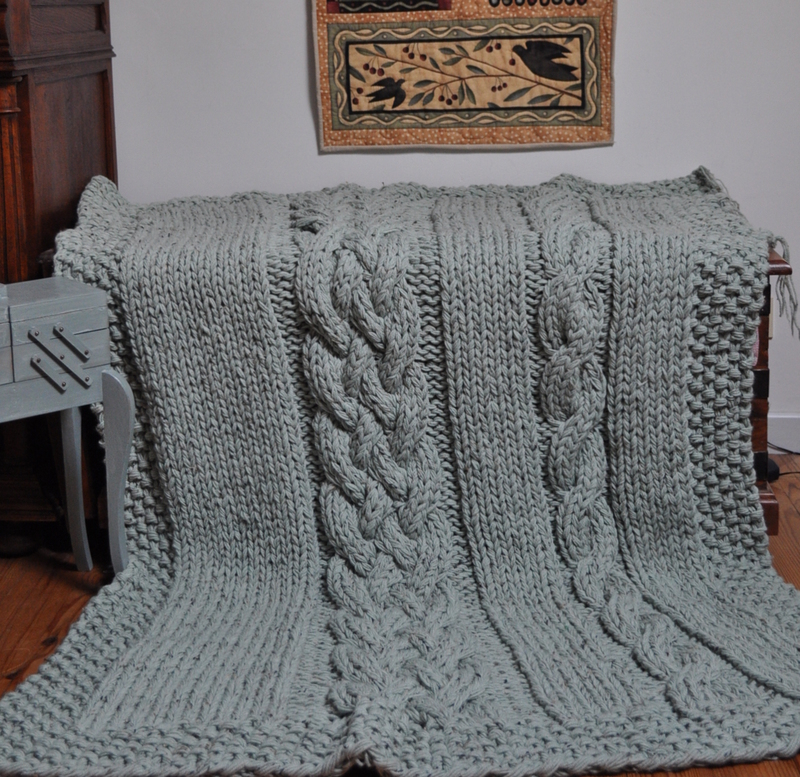 It is a little different from the humungus blankets I’ve been knitting in that it is only two strands of wool (not six) and quite skinny wool at that. The needles are 4mm and 5mm rather than 20mm so I’m finding the transition – and rate of growth – a little hard. Should keep me going for a while. 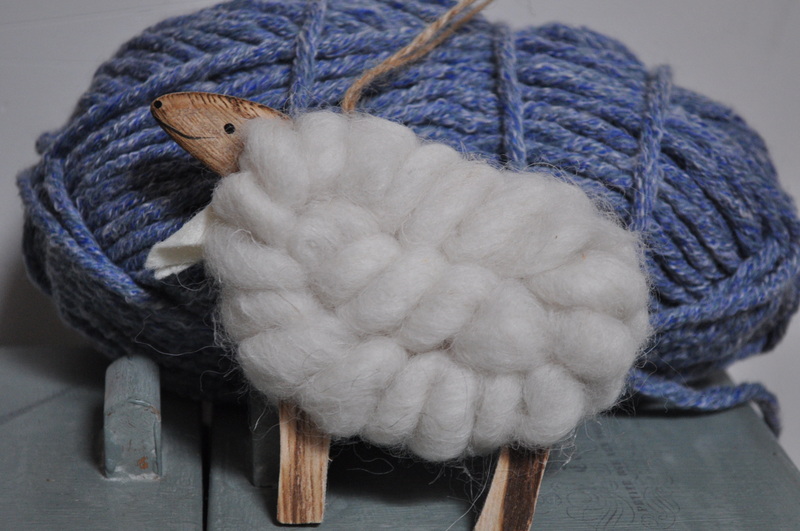 The yarn used is one strand of Rowan Kidsilk Haze and a one of Kid Classic- both with mohair – and they are delightfully soft and luxurious and, therefore, expensive. I found the Kid Classic in a pale grey – exactly 11 balls which is what the pattern calls for – on Ebay and bid high (although not as high as it would be full price) in order to knock the competition out of the water. Which I did. Just. Then I found the dark grey Kidsilk Haze from another seller and it was, miraculously, only £4 a ball. So I bought it and waited. Then I got an email to say the Hazy one was out of stock but should be in by the end of the week. Then they cancelled the order and refunded me. I was not a happy knitter. So I sent them an email and complained because I don’t like it when people sell you stuff they haven’t even got in stock. Meanwhile, I scoured the internet to find some more hazy stuff because I wanted to knit the cardi but didn’t want to pay umpteen pounds for it. 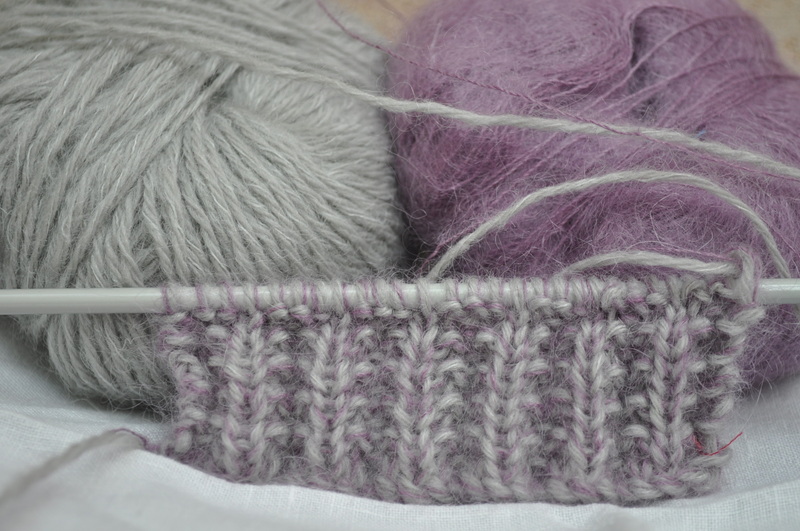 Of course, I had to find a colour that went with the light grey as you knit the two strands together. I found a young lad selling some of his mother’s yarn stash and it wasn’t a bad price so I bought it to see how it would look and I figured, if I didn’t like it, a bargain would still have been struck and I could use it on another project. Then, the seller of the dark grey – chastened by my complaint no doubt – came back and said it would be coming back into stock and, when it did, they would send it to me free of charge. So, to cut a long story not very short, I ended up with both hazy ones and made a swatch with both to see which combination I liked best and I was going to ask you which you preferred. but please don’t answer me now, unless you were going to say the second one because, as you can see by the continuation from rib into pattern, I decided on the dark grey. Another problem I had was with the pattern because when I did the swatch, I cast on 21 sts and knit 28 rows over the pattern, as instructed to obtain a 10cm square . However the pattern just wasn’t working out so I contacted the Kim Hargreaves U.K. site and begged asked for help. Apparently, the pattern is worked out in sets of 4 stitches plus 3 and they suggested I cast on 27 stitches and try again. Which I did and it worked. But, dear knitters, should I have known this? If the swatch is knitted over the pattern is it normal to have to work out the pattern first before casting on for the test square? I have never come across this before. Shouldn’t they just have you do the swatch in stocking stitch or something. Is it me? I will say though, that I was impressed with the speed with which they answered my query. Not a Scandinavian local football match result but a record of my knitting progress over the past few weeks. Warning: Knitting heavy post but for the non-knitters amongst you there are some pretty pictures and I will attempt to be vaguely amusing. As my Mum was here for Christmas, on her own for the first time since my Dad died at the end of November, I was determined to forego my usual sewing activities and Etsy shop tending and devote myself to her entertainment which involved walking slowly and aimlessly around a few shops, watching a couple of omnibus editions of Eastenders – a lot can happen in 3 hours you know – and, of course, knitting. Flushed with success by this recently finished Sirdar jacket which was a breeze to make in a yarn* that is super soft and a pleasure to work with, I decided to go all ‘independent designer’ and had a look on Ravelry for some likely pattern candidates. I love this one from Kate Davies but think it might be devilishly difficult. However it is definitely in my queue as I just love that braided design she’s created, the shape of it and everything about it really. Encouraged by lots of successful projects undertaken by members of Ravelry, I decided to buy two patterns by Andi Satterlund – well, more accurately, I bought one as the other is a generous free download – ordered in the wool/yarn and waited for my Mum to arrive with needles poised. This is the ‘Marion’ and is the one I paid for. Another interesting cable pattern and I like the cropped design. New for me, it is knitted from the top down so you knit the back then pick up stitches from the cast on edge for each front panel – no sewing up to do at the end, hooray! All was going well until I had all three pieces joined on the same needle and then I nearly went cross eyed trying to keep the cable pattern on each side accurate whilst also following the decreasing rows. Maybe I shouldn’t have tried to do it whilst watching the Eastenders omnibus. I don’t normally watch any soaps but, I must say, even when it is only on in the background it’s impossible not to get drawn in when there is a cat fight involving one woman throwing the Christmas turkey at another, people forming a human chain to help somebody move from one house to another just across the street (as you do) and the arrival of an English bulldog called Lady Di . Ah well, after many ‘unknitting’ episodes, I have given up for the moment and taken it all back to the point where I just have the back on a stitch holder and I will attempt the front panels again when I am feeling calmer. My one will be dark red by the way. Meanwhile, Mum cast on for the free download ‘Miette’ from the same designer and was often to be heard muttering (well, alright, cursing) away as she tried to keep all the stitches present and correct on circular needles which she isn’t used to. In the end she squeezed all the stitches onto regular needles and started to progress. Once I got fed up with the tortuous cables above, I cast on for my version of the ‘Miette’ and, up to now, not wishing to tempt fate, it is going well. Hopefully I will be able to do a ‘reveal’ in a week or so. 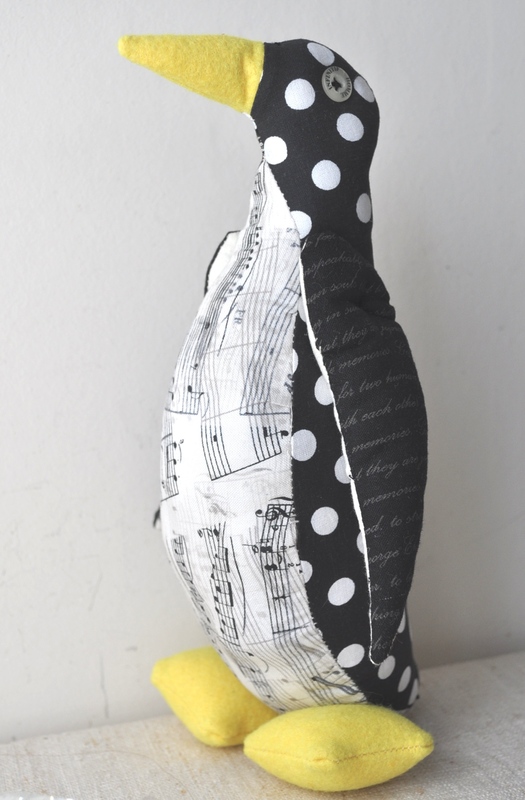 Here’s a pic of the Miette by Andi Satterlund – my one will be in a mustardy colour – if you click on it you will be taken to her blog where you will find the free download button. The second frogging was done a little while back and I am ashamed because it is a ridiculously easy pattern and yet it all went horribly wrong. It is done in a cotton yarn and in garter stitch throughout. However, every single split stitch and fault was startlingly evident and, also, I couldn’t get the gauge right because the combination of the yarn and stitch seemed to make the knitting all stretchy and weird and so it is now back in ball form in my queue. Has anybody else had problems with this boat neck sweater from Bergere de France or is it just me? To put your mind at ease, when I finally do crack this pattern, I will not be wearing it with teeny, tiny polka dot bikini bottoms – oh that I could! As the Royal Wedding approaches, I’ve chosen something topical for my Saturday Selection today. I have had knitting patterns from Debi before and she has some adorable ones in her Etsy shop. Cast Your Eyes On This! Well, my mum has arrived and the knitting has begun! I’ve been sent completely round the bend by a project she has on the go. She brought it over with her for me to ‘sort out’ but, several hours later, despite it now being hung with about 15 beady marker thingies and surrounded by air clouded with some extremely bad curses, I have come to the conclusion there is an error in the pattern! Inspired by all things knitty, I have chosen this as my Saturday Selection. 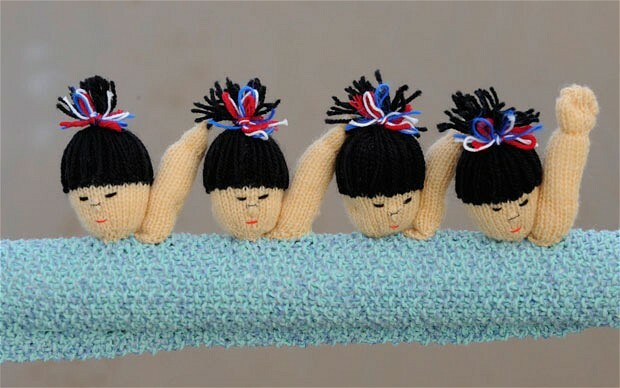 When I am a big girl, I want to knit something like this! See more fantastic big knits on BiscuitScout‘s shop.